Too often in the metal fabrication industry, the phrase “we're not set up for that” really means “we don't want to do that.” When customers are met with either the unwillingness to manufacture their parts to print or the inexperience to know how to do so properly, the end project suffers greatly. Granted, it's important for designs to be practical and feasible, but when a manufacturer says, “metal spinning with special alloys is just too difficult” it's simply not true...for Helander Metal Spinning anyway. Special alloys are in no way a hindrance to getting the custom parts you want, in the specifications you want them, and in the tightest of tolerances. 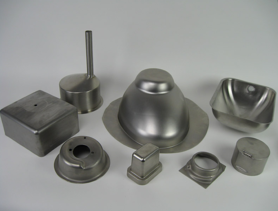 In fact, one of the major advantages of creating parts via metal spinning is the ability to create quality, uniform, products out of traditional metal, alloys, and exotics alike. As long as a part is ductile it can be metal spun and even high-strength alloys are workable and machinable. The only difficulty in working with special alloys is narrowing down and making decisions about the endless possibilities of parts that can be manufactured. Hastelloy® – Considered an exotic metal, Hastelloy® is used when a project needs extra strength but also must be corrosion-resistant. Hastelloy® is a nickel alloy that can also include chromium, iron, copper, cobalt, and manganese. There are almost two dozen different types of Hastelloy® alloys and some of the properties can exceed that of stainless steel in corrosive environments. Despite being a high-performance, 'super' alloy, Hastelloy® forms well and responds to metal spinning, creating durable, rigid, resistant parts for use in a wide variety of industries. Inconel® – A nickel alloy containing a large amount of chromium, Inconel® can be difficult to form in other metal fabrication techniques but responds very well to spinning. Inconel® is known as a high-strength steel that is not only extremely durable, but also resistant to corrosion and oxidization. It can be used in aerospace, chemical, and aqueous applications to name a few. These are just two of the many special alloys that Helander Metal Spinning can fabricate using our metal spinning capabilities. To learn more about how we work with a variety of materials, or for specific information on your project needs, feel free to contact us today 630.268.9292.